Last night was a lovely thing. 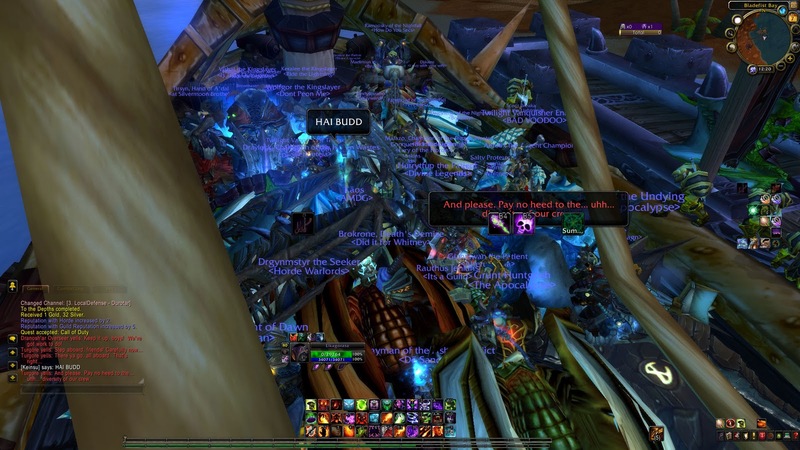 One minute I am in Wrath expansion, a global says reload software and come back in. 10 minutes of authentication failures and I get in. No disk to load, no patch to install. It was an absolutely sweet experience. Compared to the anti-climax that Nibs referred to, I thought the patch was a dream come true. I didn't do any pre-questing (ok, the just the Org fishing and cooking daily, but forgot to train-up before turning in quests). I just didn't have the time this week to spend in getting the quests gathered and turned in. I barely had enough time to log on and run Heroic Daily for Goblin rep (now revered). Learned Archaelogy. The guy is standing next to Garrosh. Picked up Azeroth Flying, made next step a dream. From breadcrumb quest, flew out to boat and started working on quests in Vashjir. Party boat headed out of Org. You don't need to click on the quest giver to turn in a quest, but really just the symbol over their head will work. Watch your mouse pointer. Due to high amount of day-1 traffic, investigate and use /tar macros. Having a ton of fun playing Destro (3/3/31). I did just put one point into Improved Life Tap as I am running out of mana by end of long fights, but not health. LT + Soul Harvest FTW! Based on Pawn's suggestion, I have already replaced 4 items (armory). Cloak - Throne of Tides drop. 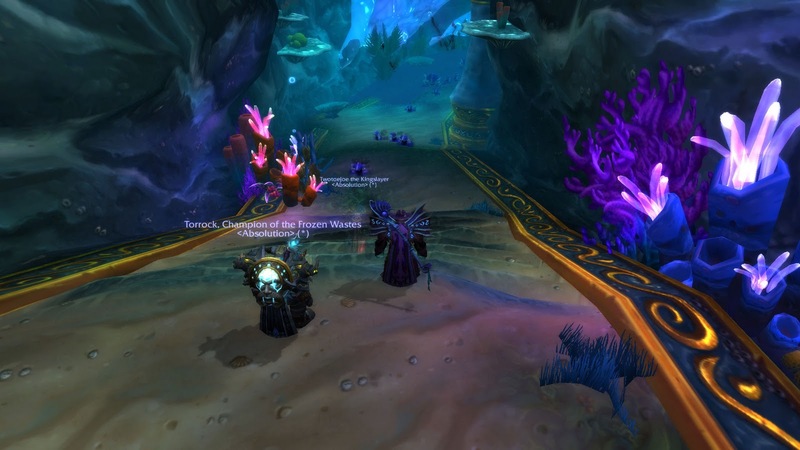 Throne of Tides is a new dungeon in Cataclysm. It is first accessible by finding the entrance to the dungeon at the bottom of the Abyssal Maw. Basically swim down to the bottom of the whirlpool and soon as fatigue starts to set in, swoosh, your inside. Once you stand in front of the portal, you're unlocked for now running it via the random dungeon finder. Inside you'll find 4 main bosses. Each will sound vaguely familiar to ones in other dungeons. 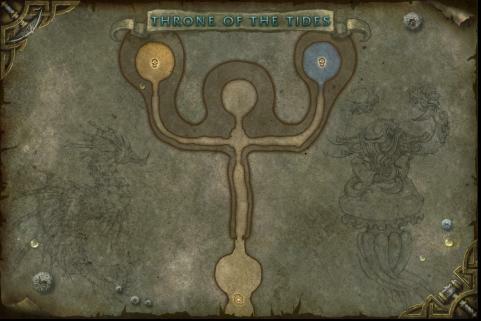 Throne of Tides in game map. Commander Ulthok drops down from the ceiling outside the Lady's room. No trash IIRC between the two. His worse ability is picking up a random team member and squeezing them. Otherwise a standard tank and spank. Right outside his room is a 'vehicle'. It's a portal to the front lobby of the dungeon. Take it AFTER the fight. Take the door way to the right. Here you will find murlocs (80 non-elite) and faceless watchers. The watchers like to throw the entire party in the air, then you float down under his feet and he smashes you into the ground. I suggest warlocks use their handy portal to escape the aoe. Erunak Stonespeaker and his head crab, Mindbender Ghur'sha. Mind the gates to this boss. They close when you engage. Erunak is a draenei shaman corrupted by a head-crab (sorta looks like octopus). He attacks you with elemental abilities including a frontal flame cone and stone spikes aoe. Just stay out of the rocks, you're good. At one point the crab, Ghur'sha, will disengage and start attacking you directly. He mind controls a random party member, stops when they hit 50% health. He links everyone to him, sucking health, use pilars to stop LOS.Fairly easy kill, IMHO. Run back to other side, now you have elementals. At the bottom of the stairs, is a water elemental gauntlet. Kill the elites, aoe the non-elites and keep running to the gateway. The non-elites will spawn as long as you sit there. Final boss, Ozumat. (another gate to mind) This is fight is a lot like Valythra in ICC. Neptulon(sp?) is under attack. You gotta to kill off all the adds before they kill him. I found the caster adds to be harmless. They don't move and at one point only focus on Neptune. You DOT and go. Just gotta watch out for the Bloodbeasts (ala ICC Saurfang Jr.). Nothing a little soulshatter or shadowflame don't handle well. Ozumat is the giant sea squid. Luckily for you after you kill all the aoe bosses, Neptune empowers you and you can take on Ozumat directly. Imagine a giant sea-star and you're inside the aquarium. Target it's mouth, fire at will, standard rotation. Well, time to grab some lunch, before a few more quests. I'd love to be 82 by EOD. We'll see, I have a family commitment from 2:30PM until 9PM tonight. From the lock trainer, I just learned Fel Flame, so need to work that into my rotation.I plan to place between immolate and incinerate, to provide that wee bit of time buffer between those spells. 10 minutes?! *shake fist* Took me over an hour. And yeah... have to get archaeology. Don't get me wrong, the digital download was a dream and I'm very please with the new expansion.. but the launch event.. was a bit disappointing.. and it feels like it never quite finished. I just.. I guess I wanted to experience the floods and fire and brimstone.. instead of just sort of waking up and finding out everything had already happened when patch 4.0.3a hit. I just never really go a feeling of resolution from the launch event. Add to that.. I honestly do wonder how long Deathwing is going to fly around.. all expansion long? @Nibs, don't get me wrong, they could have done so much more. After reading "The Shattering", I wondered when Garrosh was going to battle Cairn (to the death)? Did they ever show the dwarf Did I miss it? The ambush of the druids in Ashenvale? I wanted an AQ type building, where we competed to gather resources. I missed in vanilla, but heard fun stories about it. Where's the grandeur, the spectacle?